Not every user has the luxury of an Internet flatrate and I personally know a few who are still using time or data limited Internet accounts. I experienced this as well when I used my mobile phone to connect to the Internet during a holiday. Every byte counts sometimes and it is always a good idea to monitor the bandwidth that you are using in that time to make sure you do not cross the threshold to either get the account limited or pay extra. Not only because it gives a clue about the bill that you can expect at the end of the month but also to have proof that you did not download more than the amount shown in the logs of the software. The Cyber Bandwidth Monitor is one application that monitors bandwidth usage and displays daily, weekly, monthly and total stats. Each period is divided into uploads, downloads and a combination of the two to give you exact data that you can work with. You have the option to display a system tray icon that is showing a (mini) graph or a smaller window that can be set to be always on top. There is also a ping and traceroute function but I do not think that many users will need that, but it can be useful if you notice issues with your connection and want to troubleshoot the issue. Buttons for alerts and exports are also available but the functions have not been implemented yet. They will be most likely added in the coming releases. 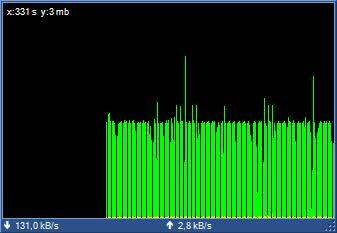 Cyber Bandwidth Monitor is using roughly 6 Megabytes of RAM when run in the system tray. I’ve been using NetMeter (http://www.metal-machine.de/readerror/index.php)for a while now. It’s pretty mature, seems to do everything that cyber does except ping/tracert. It can give you a projected usage for the day/week/month and you can export the logs in csv format. It also takes a minimal amount of ram. Please update: this is actually stolen code. The original author has discovered this and has removed the original open source code and transferred it to closed source for the time being. Yep! After installing this one you’re in that painful spyware removal mode. plus a couple CheckThis.exe CheckThat.exe NOT referenced in the install. Therefore this is CRAPWARE and should NOT be talked about.